Bored with your standard customer survey questions? If you’re a bit tired of the same old questions, imagine how your customers are feeling. There’s so many great ways to ask for feedback, and each variant gives you a slightly nuanced response. 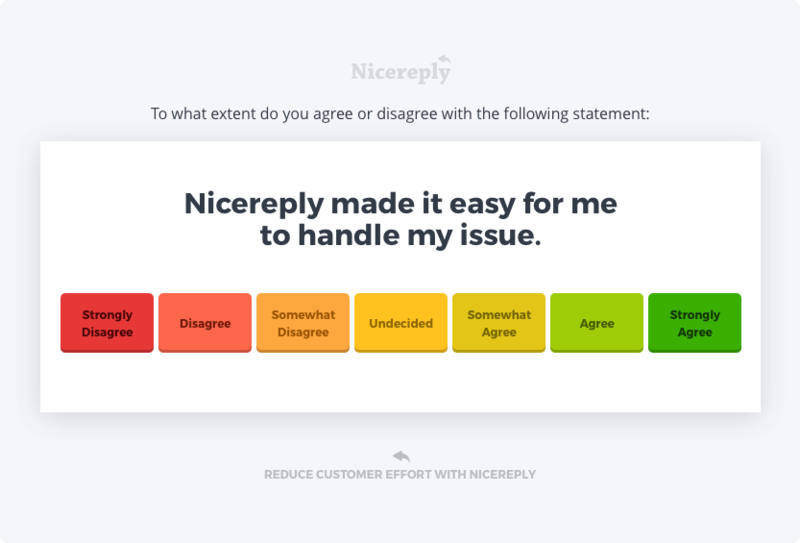 Nicereply gives you the option to customize survey questions to ask the exact question you have in mind. You can customize images and add follow up questions. The survey world is your oyster! We’re a big fan of mixing it up and trying new things. Here’s 18 different ways you can ask your customers what they think of your service or your product! Are you satisfied with the resolution of your ticket today? A frequent concern of support managers is that the feedback they get through surveys is too focused on the product, while ignoring the support experience. The comments from customers aren’t actionable for the support team, and it feels like the support team doesn’t have control over the score when customers are focusing on product functionality. 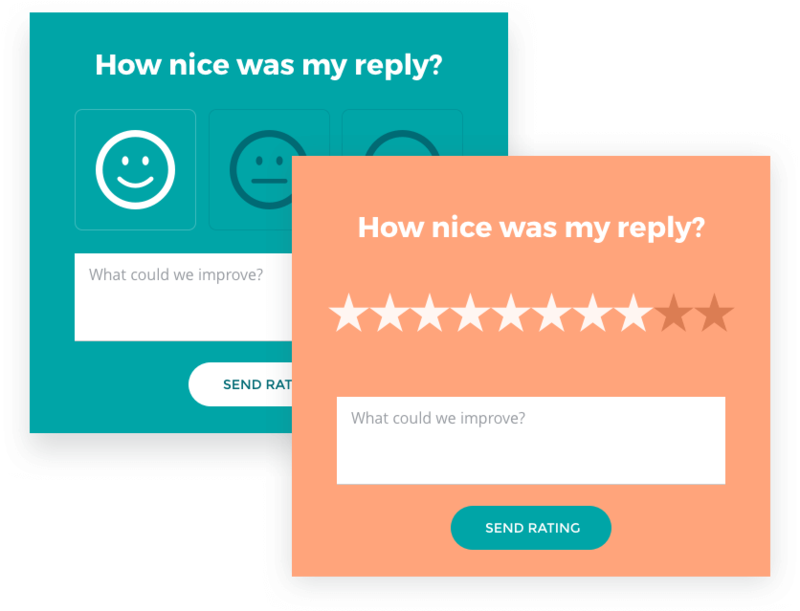 But small changes in the question you ask your customers after support interactions can help get more actionable, support specific feedback. How did [Agent’s Name] do today? Make it personal, so that customers think about support agent’s work, and not the product. Thinking specifically about the last interaction, how satisfied are you with the service you received today? First, how satisfied are you with [Company]? Secondly, how satisfied were you with the customer service agent you talked to today? Customer Satisfaction isn’t the only question you can ask customers. If you’re consistently seeing really high CSAT scores, the feedback you’re getting might not be helpful. Plus, tracking customer satisfaction doesn’t always give a good indication of customer’s long term loyalty. For example, Bain & Co has reported that 60-80% of customers who churn said they were satisfied or very satisfied in their last CSAT survey. Layering another metric on top of your customer satisfaction surveys can really help identify what your customers think – and what they might do next. Customer Effort Score: How easy was it to resolve your issue today? 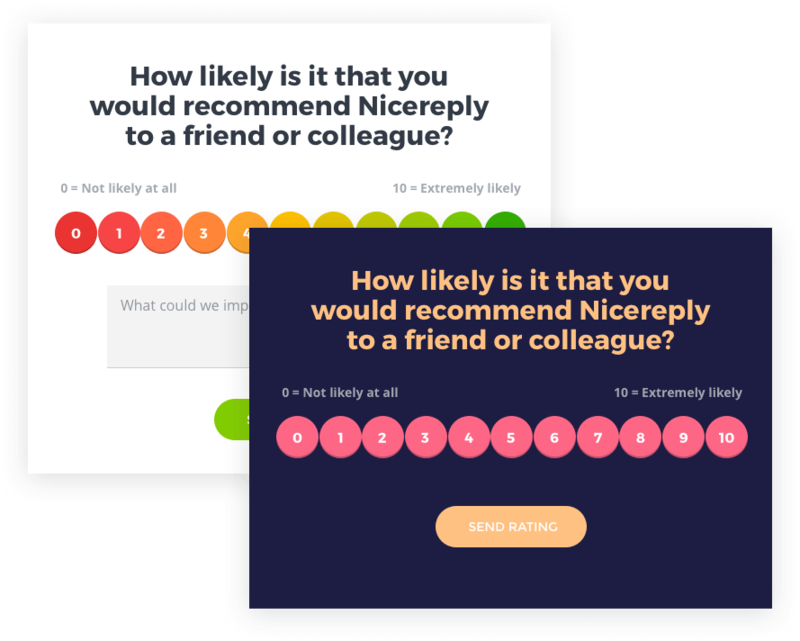 Net Promoter Score (NPS): How likely are you to recommend Company to your friends or family? When customers aren’t responding to your surveys consistently, it’s tough to fully understand what your user base thinks. The estimate is that only 1 out of every 26 unhappy customers will take the time to complain. To hear from the other 25 customers, you need to make it as easy as possible for them to give feedback. That means short surveys, easy to understand questions and one-click feedback options. With just one click, tell us how we did today. Did we answer your question today? You can always follow up after the click with another question to get more information. Sometimes you don’t just want to know how your last customer service interaction went, but how your customers feel about your company in general. While CSAT questions focus on a transaction, there’s other questions you can ask to focus on the total experience. We call these questions “relational questions”. Relational questions ask customers to think about the big picture. They give you great insight to why your customers stick around – or if they might have one foot out the door. Try asking customers relational questions a couple times a year to. Keep testing new survey options to keep response rates high and customer insights even higher. Your customer survey questions aren’t set in stone! Inspired by any of the examples in this article? Let us know how you’ve mixed up your customer satisfaction survey on Twitter @nice_reply.